Turning Leaf have created the ultimate summer recipe, inspired by its Pinot Grigio wine. 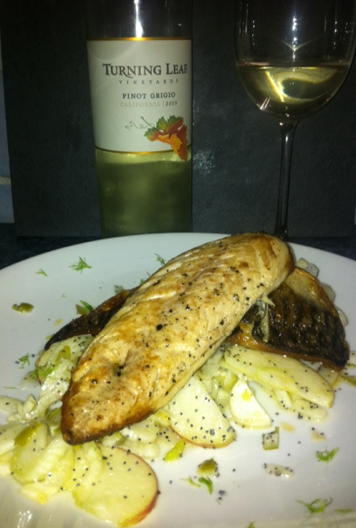 The crisp and fruity wine goes really well with the pan-fried mackerel and the fennel and green apple salad makes it really fresh and light – the perfect dish for a summers lunch. The recipe was created as a collaboration between Turning Leaf winemaker Stephanie Edge and culinary artist Esther Röling – we gave it a go ourselves (substituting the green apples with Braeburn) and thought it pure genius! Use a peeler to remove the zest of the limes. Only remove the green, avoid peeling the white pith. Cut the peel into small squares. Bring water to a boil and add the zest and remove after 20 seconds. Repeat once more with fresh water. Add the zest to the oil. Remove the green tops from the fennel and keep aside. Slice the fennel as thin as possible (if available use a mandolin). Toss the fennel with the lemon juice, fennel tops, olive oil, salt and half the apple. Leave in the fridge to soften for about half an hour. Keep the other half of the apple aside in the fridge. Warm up a frying pan medium hot. Add the olive oil to the pan. Season the mackerel with salt and pepper. Place the mackerel, skin side down in the pan and carefully push it down to prevent the fish from curling up. Turn the fish after 3 minutes and cook it for another minute flesh side down. Place a bit of the fennel in the middle of a plate. Put some apple sticks and dill around the fennel salad and drizzle with a bit of the lime oil. Scatter the poppy seeds over the apple. Place the mackerel on top of the fennel salad.